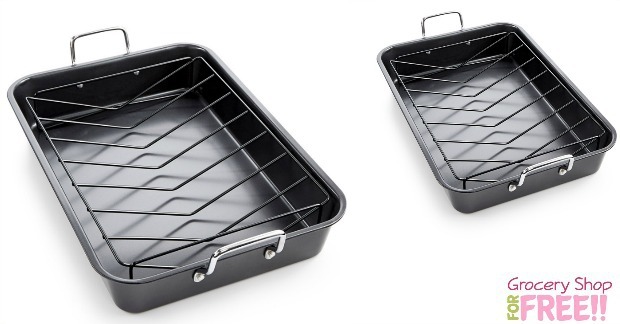 Tools Of The Trade No-Stick Roaster And Rack Just $7.99! FREE In-Store Pickup PLUS Extra 20% Wow Pass! You are here: Home / Great Deals / Tools Of The Trade No-Stick Roaster And Rack Just $7.99! FREE In-Store Pickup PLUS Extra 20% Wow Pass! Tools Of The Trade No-Stick Roaster And Rack Just $7.99! Right now you can get this Tools of the Trade No-Stick Roaster and Rack for just $7.99! You can choose to pick it up in-store for FREE shipping, too! It’s normally $24.99! Buy online and Pick-up in-store and get an EXTRA 20% OR 15% OFF WOW Pass to use on your next in-store purchase. One pass per customer per visit. Wow Pass good for 30 days on in-store purchase only. The roast with the most. Juicy, mouth-watering turkeys and tender roasts cook quickly and easily with this non-stick roaster and rack from Tools of the Trade. Limited lifetime warranty.